This piece may have you dreaming of a rendez-vous with Mr. Right. PROs: Handmade tile mosaic artwork composed of natural marble that is guaranteed to elevate your space. 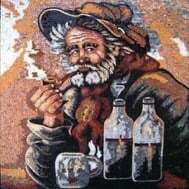 Mosaicist: Haith D.
CONs: You’ll spend hours wondering what your mystery man looks like, but what a nice way to spend your time.